One of the great things about the Historic Churches Bike Ride is that you get to see inside churches that wouldnt normally welcome you. I chose the 2003 ride to mop up the north-west of the county; there were still a lot of churches here Id never visited, partly because it is the area of Suffolk furthest from where I live, but also because its churches are notoriously difficult to get into. I got the long-suffering and saintly Jacqueline to drop me and my bike off in Newmarket in time for the ten oclock start. Newmarket is a great place, quite unlike anywhere else in England. Many towns have cycle lanes nowadays; Newmarket has horse lanes. And unlike cycle lanes, horse lanes have priority. I thought that was brilliant. Its also dead posh, so you get to weave in and out of grid-locked Mercs and 4X4s as they wait for the horses to cross. The poshest part of town is the Bury Road, which leads from the clock tower in the centre of town out to the gallops. I was left about 200m out of town outside the gates of St Agnes. This is a fine looking 1880s century church, the work of the Duchess of Montrose (well, why not? Winston Churchill enjoyed a spot of bricklaying himself, apparently). 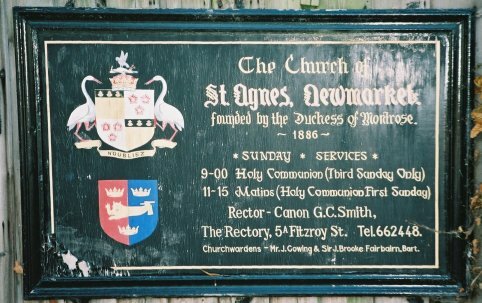 The Duchess was called Agnes, hence the dedication. It is quite different in scale and composition to the bulk of west Suffolk 19th century churches, which were generally intended to serve outlying poorer communities in these large parishes. As at Kenny Hill, St Agnes has a campanile tower; but the one there is pencil-like and functional, while the tower of St Agnes is a splendid and flamboyant thing. 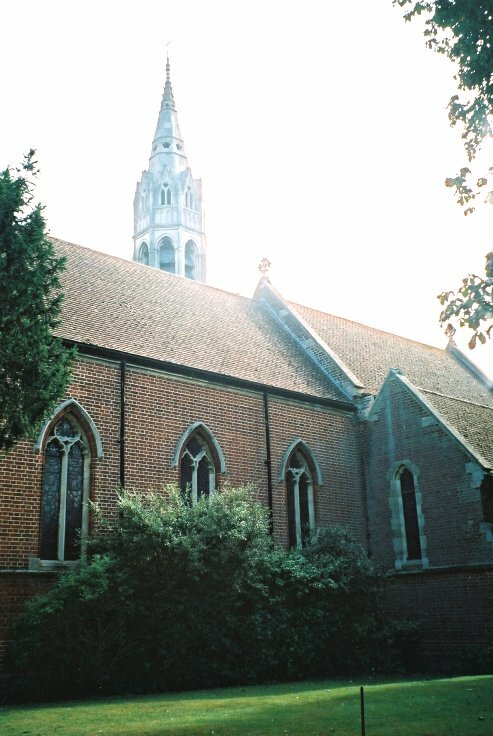 The parish was carved out of the historic parish of Exning, but is now firmly set in its ways as a Newmarket town centre church. Having photographed the outside, I rushed to the south door, my bike-ride form in my hand. It was locked. I looked around the outside, but nowhere else was open. It turned out that St Agnes simply wasnt taking part in the bike ride. I hope this is remembered by the Suffolk Historic Churches Trust if the parish ever comes cap in hand for money. A lady at St Marys told me that there simply werent enough people to go around to provide welcomers for all the Newmarket Anglican churches. Even including its suburb of Exning, Newmarket is still smaller than nearby Haverhill; but Haverhill has only one Anglican church, and Newmarket has five. 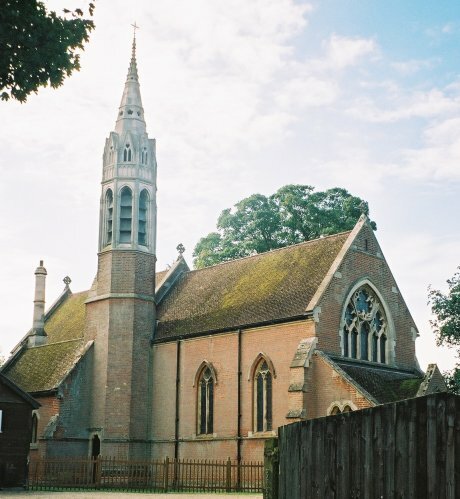 Partly, this is a result of a historical accident; All Saints, south of the High Street, used to be in Cambridgeshire, and one of the current Exning churches is the former workhouse chapel. The churches appear to have reached some kind of compromise, so St Mary provides a home for the anglo-catholics, All Saints for the evangelicals, and St Agnes for the rich people. But still, I should like to have seen inside. 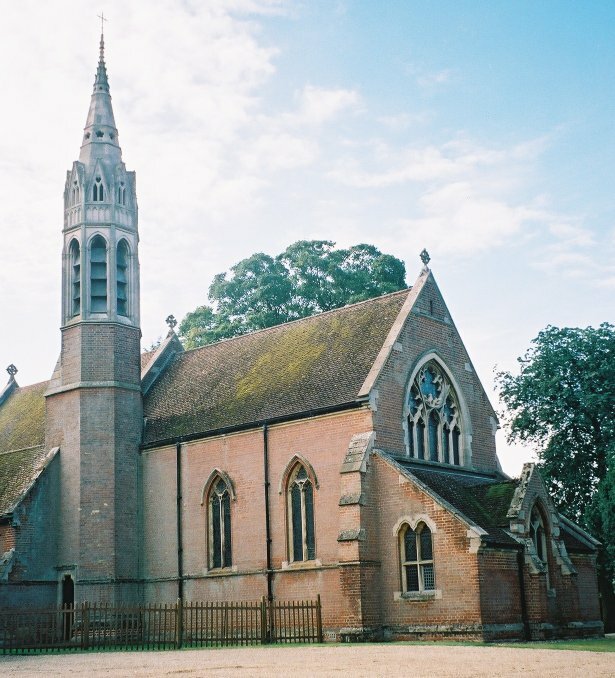 Not least, because this church is generally recognised as having the richest, most opulent 19th century interior in Suffolk, Felixstowe St John not excluded. The architect was RH Carpenter, and lets just say that the Duchess didnt keep him on a tight budget. More than that, it hasnt been spoilt since, so still contains all its original furnishings, as well as the mosaics and tiling on the walls. I am told that the reredos is quite the most splendidly camp object in the entire county. It is a white marble bas-relief of St Agnes and her lamb being borne up to heaven by angels from the Colosseum, where she was martyred. As Mortlock wryly observes, the subject was the cause of some agitation at the time. Hey ho, on we go. All Saints next.